This Hampton Nautical premium quality Captain's Chrome Sextant 8" is a beautiful full-scale reproduction of the British Captain's 6-inch radius vernier readout brass nautical sextant. Each sextant is expertly crafted from solid chrome and marked with a unique serial number. The sextant has an accurately divided German Silver scale, and a gear driven slow motion control for making small adjustments to the index arm. A powerful magnifier can be swung into position to assist in reading the vernier scale. The sextant's telescope has polished glass lenses and produces a sharp magnified image. The index mirror has three recessed adjustments. There are six tinted swing-arm filters with heavy chrome filter mounts. On the back of the sextant is a hardwood handle with a thick chrome plaque engraved "Hampton Nautical" and the unique serial number. 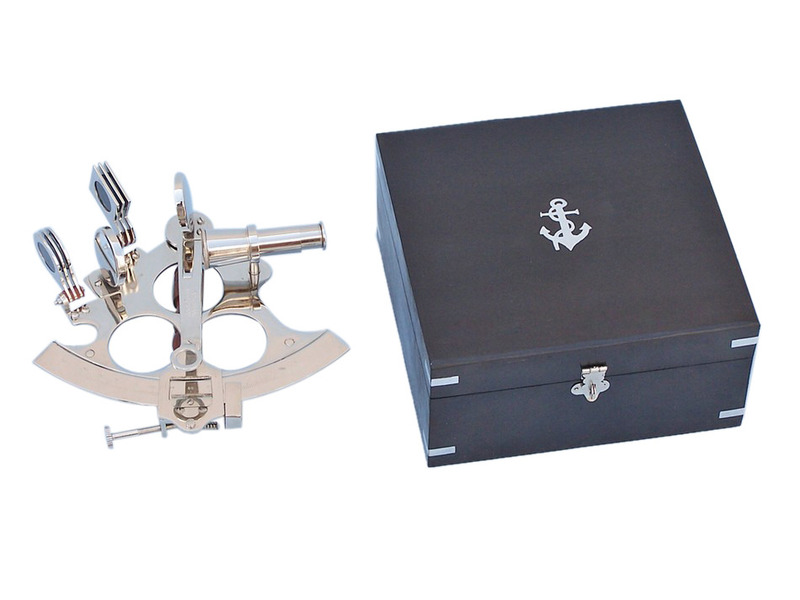 The sextant comes with a beautiful felt-lined hardwood case with an inlaid chrome box and the Hampton Nautical anchor with rope logo embedded into the top of this smooth and polished black hardwood box. The dimensions listed are the dimensions including the box.